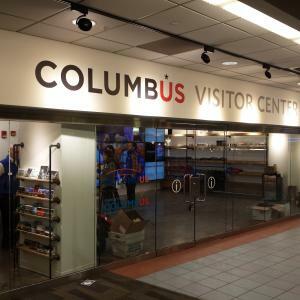 If you&apos;re traveling to Columbus, you now have a new spot to go for in-person visitor information - we at Experience Columbus just opened our third visitor center inside the Greater Columbus Convention Center. The Convention Center is conveniently located near downtown Columbus&apos; largest cluster of hotels, and make it incredibly easy for convention and meeting attendees to find fun Columbus activities to do in their down-time. The new visitor center has a local emphasis, from the design and construction companies to the building materials and merchandise. Experience Columbus partnered with Columbus-based DesignGroup and Compton Construction to complete the project. Re-purposed barn wood was locally sourced and used to construct the shelving, chairs and tables within the space. Additionally, the center features locally designed merchandise and souvenirs for purchase. Located in Suite 127, adjacent to the Food Court, the visitor center is open Monday through Friday, 9 a.m. to 5 p.m., and Saturday and Sunday, 10 a.m. to 5 p.m., with extended hours during major conventions and events. 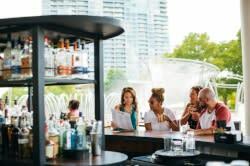 Visitors can stop in to learn more about Columbus’ top attractions, restaurants, nightlife and neighborhoods, and discover what’s happening in Columbus during their stay. You can also now redeem your Columbus Coffee Experience card there for a free t-shirt! Experience Columbus&apos; other two visitor centers are located at locations at 277 W. Nationwide Blvd. and at Easton Town Center. For more on our visitor services and travel planning assistance, click here.